The first new office building to be built in downtown South Bend in more than 20 years also has secured a major tenant that will occupy most of the space. The law firm Barnes & Thornburg LLP signed a 15-year lease to occupy three of the five floors in what will be called the Barnes & Thornburg Building at 201 S. Main St. 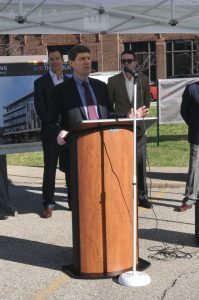 The building, which is being co-developed by Bald Mountain LLC; Norris Equity Partners and Great Lakes Capital, will take between 12 and 18 months to complete. The law firm, which will occupy 31,200 square feet of the building, expects to move into its new space by summer 2021. The building has 41,400 square feet of rentable space, according to Norris Equity Partners. It will feature 23 underground parking spaces for tenants and additional surface lot parking spaces only for tenants. The building’s main floor will house a coffee shop and restaurant at street level. The building’s co-developers are working with several partners to design the space, which will include fourth- and fifth-floor terraces that face the building’s west side. Barnes & Thornburg will continue operating at its present South Bend location at 700 1st Source Bank Center, 100 N. Michigan, until it moves into the new building. Barnes & Thornburg formed following a merger in 1982 between South Bend-based Thornburg, McGill, Deahl, Harman, Carey & Murray and Indianapolis-based Barnes, Hickam, Pantzer & Boyd.